Most famous for his northern industrial landscapes and his matchstick people, LS Lowry has long been considered one of Britain’s favourite artists. However, where he was once seen as a naive and simplistic painter, the complexity and tonality of both the artist and his art now enjoy a newfound appreciation that has changed the way we view Lowry’s work. Today, on what would have been his 130th birthday, we’re looking back at Lowry’s life, influences, and inspirations to find out just how those matchstick people came to life. Born in Lancashire on 1st November 1887, LS Lowry often spoke candidly about his unhappy childhood, his peevish and exacting mother and his affectionate but withdrawn father, both of whom would go on to influence his work in some way – most notably the harrowing ‘Horrible Heads’ series he painted during his mother’s final months. Indeed, his earliest works carry all the hallmarks of this particular source of inspiration, and he began his career painting very dark, very impressionistic paintings that provide a stark contrast to his later white backgrounds and simple, colourful palettes. This later style, his most recognisable, would start to come into focus after encouragement by one teacher – D.B Taylor of the Manchester Guardian, a great exponent of Lowry’s career – to ditch his sombre palettes for something brighter. While LS Lowry painted everything from seascapes to portraits, it is his urban landscapes for which he is most recognised. After a change in his family’s fortunes caused them to move to the industrial town of Pendlebury when Lowry was 22, he was exposed for the first time to the factory-filled and chimney-forested landscapes of the industrial north west, a vista which he admitted he initially hated before a growing fascination took over. Now painting with a much more basic palette and an even, quiet contemplation, Lowry’s almost repetitive style demonstrates this lifelong obsession with the people and the landscapes of the north. With the birth of his signature style came recognition and Lowry began to sell his work for ever increasing sums, eventually commissioned as the Official Artist at the coronation of Queen Elizabeth II in 1953. Despite his newfound popularity, fame and wealth, he maintained a modest – and fiercely private – lifestyle, known to his friends as the quirky and mischievous storyteller who would draw thousand-pound sketches on the backs of napkins and hand them to strangers, who kept a collection of clocks all set to different times, and who would keep a suitcase by his door so he could pretend he was ‘just leaving’ in case of unwanted visitors. Despite his steadfast dedication to being seen as a ‘simple man’, underneath Lowry was complex and often tormented in a way that is only now just being appreciated in his art, suffering bouts of depression after the death of his mother and living alone for the rest of his life. In public, he could be seen taking the bus in his hometown of Mottram or talking about his beloved Manchester City, while in private he gathered collections of pre-Raphaelite art and championed fellow artists through mentorship and purchase. He died in 1976, aged 88, leaving a body of work that is now valued in the millions – treasured for the very traits that defined him as a person: a mix of fascination and emotional distance that makes up the backbone of this ‘simple’ artist’s work. Since much of his most famous work is of urban landscapes, it is particularly exciting when a Lowry piece emerges featuring different subject matter. We’re lucky enough to have three such original Lowry artworks here at Trinity House at the moment: At the Seaside (1955), Girl pushing three children in a pram (1962) and Ashbury Church. 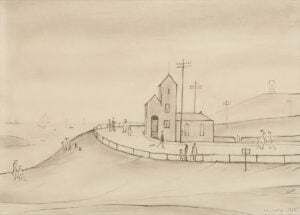 These evocative sketches and pastel drawings feature Lowry’s signature style and matchstick figures but in varying, quiet and more personal settings and would make a fascinating addition to any Lowry collection. LS Lowry was so dedicated to living a ‘normal’ life, he didn’t give up his day job until he was 65. He worked as a rent collector until retirement even after his success, claiming that he took inspiration from his tenants and put them in his paintings. LS Lowry worked as a war artist from 1943. LS Lowry was much venerated in Paris in his time and was perhaps even more famous and successful there than he was in London. After his death, a number of darker pieces known as the “Marionette Works” were unearthed in Lowry’s possessions and are now available to view at the LS Lowry Centre only upon request. The “matchstick men” referred to in the eponymous song by rock legends Status Quo is a nod to the paintings of L. S. Lowry. Explore the artist’s full collection at Trinity House or get in touch with our team to find out more.